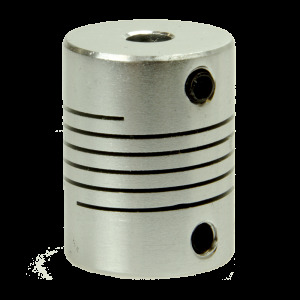 Sturdy but still flexible motor coupling for 5 mm shaft, great for driving high-precision axes with lead screw or threaded rod. Reduces wobble in your axes by allowing flexibility at the end of the rod. This 5 mm / 5 mm flexible motor coupling is a great solution for driving axes which require high-precision movement. The coupling allows for flexibility in all three axes, reducing the wobble on the rod. This removes a lot of the unwanted motion of the rod. This motor coupling is for usage in your 3D printer's Z-axis as well as CNC machine axes. The coupling fits on all our 5 mm shaft stepper motors and can be used in combination with the 5 mm threaded rod.